I am the proud owner of NutriBullet 600. I did my research, read the reviews, compared it with various blenders, even the mighty (expensive) Vitamix. But the NutriBullet won, its advertising winning me over, along with the enthusiastic recommendations from fellow nutritionists already using it. In the end, I decided the NutriBullet met all the criteria I wanted. It also counteracted the grievances I had against my juicer. But my purchase didn’t go smoothly and I certainly won’t be making that mistake again. Last year I purchased my first juicer which was highly recommended by Which? magazine as well as the great juice master himself – Jason Vale. My family would become so healthy. My kids would consume their daily quota of fruit and veg and not even know it! I couldn't wait to get juicing! And it worked. I used it most days. Everyone loved their juices and looked forward to a new flavour each day. But now my juicer is gathering dust and taking up space. I feel guilty every time I look at it, which is every day. But why? Well, although the machine works fantastically well, everything juiced to perfection, I was never happy about all the pulp left behind. For a start, I’m a great believer in eating lots of fibre and here I was throwing away all those valuable vitamins, minerals and fibre. It’s also a pain to clean up. OK, it doesn’t take long. But you have to throw out the pulp, then rinse the container. You also have to take apart the juicing sections and rinse them out. The blades and sieve section can take a while to remove all traces of food. Then there’s the relatively large size of the machine. With a small kitchen, I have no storage space left and so my juicer must sit on the table, taking up valuable workspace. It's a slimline appliance, taking up little workspace (and it looks good)! To wash it, simply unscrew the blade section, separating the cup portion. Then rinse the blade under running water and that’s it. You can drink your smoothie/juice/nutriblast straight out of the cup or decant it into several smaller glasses. All parts of the NutriBullet, except the motor base and the blades, are dishwasher safe. Once I’d made my decision, I searched out best prices. To be honest, there wasn’t much to choose from. Most places were selling for £99.99. Ebay was definitely the place to go for a good deal. 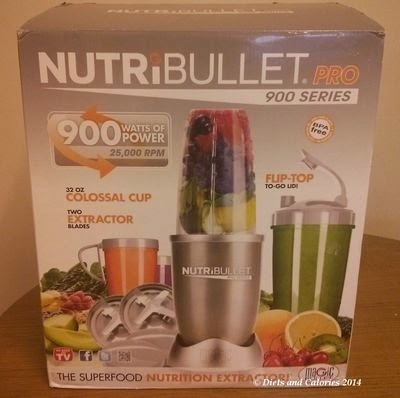 However, during my searching, I noticed some new reviews, for a NutriBullet 900 Pro! What on earth was this I wondered? The NutriBullet I was investigating was called the NutriBullet 600. The 600 is the wattage of the motor. It’s this that makes it so effective at blasting all the ingredients to a smooth consistency. But this 900 was the latest, ‘improved’ NutriBullet. It corrected the minor deficiencies of the 600, which according to some reviews, can leave small pieces of some particularly stubborn food. It also came with a supersized cup, as well as the regular tall cups, and a flip top lid, and handles and regular lids. Well, I thought, if there’s a new one out, I may as well get that. Makes sense. Trouble is, it’s only available in the US. No problem. There were lots of people selling them on ebay and shipping to the UK. As for the prices! So much cheaper than the UK. Rip off Britain at work again! I could buy the latest brand new NutriBullet 900 Pro, including a hardback colourful recipe book, pack of superfood ( a mixture of chia, goji, cacao nibs and maca – USDA Organic), AND shipping costs included for the price of £83! In the UK I could purchase the NutriBullet 600 on its own for £99 plus any shipping costs. No brainer! I couldn’t wait for it to arrive. However, after I’d ordered it, it suddenly occurred to me that it would have a US plug. No problem. I’d buy an adaptor. In fact, we already had one. It was only after a chat with my Dad one day, when I mentioned my soon to arrive purchase, that he queried the wattage. This is an area I know nothing about. But, it seemed that if I plugged in my US gadget with its 110V into the UK outlet with its 240V, I’d either blow up the machine or possibly short circuit my whole flat. OK, not to be defeated by my ignorance, we discussed the options. I could buy a step up/step down convertor. These convert the voltages up or down depending which way you’re going. A few people sold them, which inevitably meant they were expensive. My goodness, some were over £100! I could find one at around £50, but they are big, ugly gadgets which totally defeats the purpose of the elegant slimline NutriBullet. My ‘cheap’ NutriBullet was getting more expensive by the minute. My only alternative it seemed would be to send it back. Checking through the sales page, there was no mention of the wattage or any kind of warning for UK customers that it would not work without a convertor. 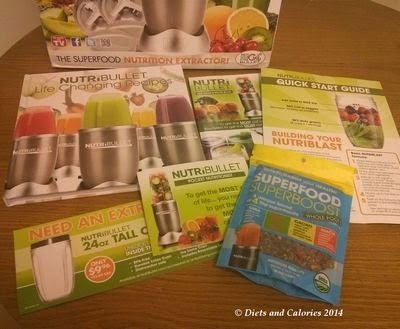 When I investigated other US sellers also selling the NutriBullet, the majority had large red letter warnings to US customers about my exact problem. Unfortunately, when I contacted by seller, they were unimpressed with my ignorance. I should have known, or I should have asked questions. In my defence, I did assume that something being sold to the UK would be ‘fit for purpose’. They said I may as well keep it as it as I’d have to pay back their shipping costs, plus my own. In the end it would cost me more to send it back and I’d be out of pocket. Looking up shipping costs, it seems they were right. It would cost be nearly as much as the machine I’d bought to send it back. I rang NutriBullet UK and asked whether they would accept my 900. They were unhelpful to say the least and couldn’t offer any suggestions. So it seemed I was stuck with an unusable NutriBullet. I couldn’t even sell it on ebay. What to do? The next day I had an idea. 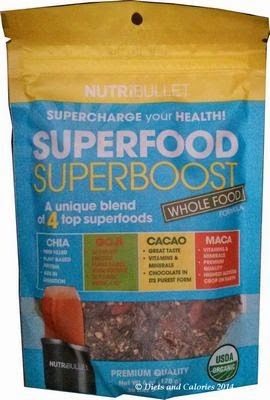 I really wanted to keep the superfood which I couldn’t find in the UK (all in one combination), and I liked all the extra parts. I was also enjoying looking through the glossy recipe books and all the different ways of making NutriBullet shakes. So at least I’d still have those. I guessed I’d have to continue with my old blender. I’d read from the US reviews that the NutriBullet 600 was compatible with the 900, so all those who owned a 600 could upgrade to the 900 and still use the cups and blades etc. That led me to wondering whether I could purchase just the 600 base. A search on ebay revealed plenty of US bases being sold. But hooray, there was one, yes one person selling UK bases. Oh joy. It cost me £39. I’ve never been so pleased to see one of those clunky square UK plugs in my life. My beautiful new NutriBullet 600 base worked perfectly with my NutriBullet 900 attachments. Success, of a sort! Powerful 25,000 RPM motor blends with ease (900 only). Extractor blade breaks through seeds and stems. Resealable lids help keep your drinks fresh. Flip-top lid is perfect for taking drinks on the go. Easy-to-use, buttonless operation lends convenience. I should imagine the NutriBullet 900 Pro will arrive in the UK at some stage. From what I’ve read, it blitzes the contents even more finely than the 600. It also has some extra accessories such as the colossal cup, which is the one I use to drink from. When the 900 eventually arrives here, I’ll probably try and buy the 900 base. But in the meantime, the NutriBullet 600 is one of my favourite and most used kitchen gadgets this year. 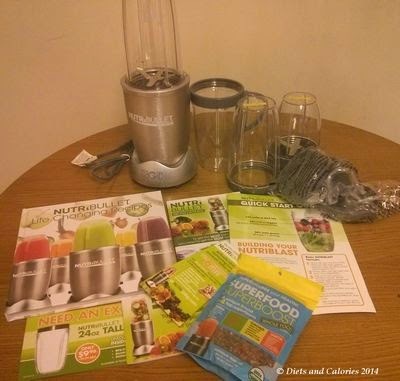 Read about my Nutribullet 600 'experiences with using a NutriBullet' review [HERE]. The NutriBullet 900 is now available in the UK from BuyNutriBullet.co.uk. If you've already bought your NutriBullet and are looking for delicious smoothie recipes, you must check out these NutriBullet Recipes. Here you'll find a collection of gorgeous smoothie NutriBullet recipes for all ages which aren't in the NutriBullet recipe books. Each healthy smoothie recipe is accompanied by a beautiful photo, which are bound to get you trying out new varieties. I, for one, can't wait to try out the easy banana, coconut and fennel shake.